The Zephyrhills Bulldogs soundly defeated the Wesley Chapel Wildcats by a score of 45 – 9. They will play at home next Friday, September 5th. Kickoff is scheduled for 7:30 p.m. Ryan Pickett, a graduate of ZHS was at the game tonight. He was #79 for the Bulldogs and had the nickname, “Big Grease”. Gulf 35 Wiregrass Ranch 20. Click on the Tab at the top of the page to see the complete ZHS Bulldog Varsity Football schedule and check back after the games for final scores for the Bulldogs and other teams that have an impact on this area. A player who honed his skills at Bulldog Stadium at Zephyrhills High School will play beneath much brighter lights on Sunday, Feb. 6. Ryan Pickett, a member of the Green Bay Packers, is headed to his second Super Bowl. The defensive lineman was born in Zephyrhills and played with the Bulldogs from 1994-1997. Some of his fondest memories are of playing Friday nights against Pasco County rivals like Pasco High and Land O’ Lakes High. Tom Fisher coached Pickett at Zephyrhills and remembers him as one of the biggest and strongest he has seen. Fisher is still a teacher at Zephyrhills and said Pickett was definitely one of the best he has ever coached. Zephyrhills principal Steve Van Gorden said his performances are a topic of conversation around the school. As a senior at Zephyrhills, Pickett recorded 119 tackles and seven sacks. His accomplishments were honored in 2008 when his alma mater retired his number 79. Pickett still wears the number with the Packers. Pickett was one of the top defensive recruits coming out of high school and signed a scholarship to play at Ohio State University. Unlike most freshman in college, Pickett played in every game his first season, including starting the final nine. He recorded 109 tackles, 20 for a loss, and eight sacks at Ohio State. Pickett, 31, left after his junior season and was selected with the 29th pick of the first round in the NFL draft by the St. Louis Rams in 2001. He played five years with the Rams before signing with Green Bay as a free agent after the 2005 season. He was re-signed by the club before this season to a four-year, $28 million contract. During his 10-year career, Pickett has recorded 454 tackles, nine sacks and 24 passes defensed in 148 games. This season, he played in 14 regular season games, 12 starts, and racked up 32 tackles and a sack. Pickett reached the Super Bowl his rookie season in St. Louis, but was denied the Lombardi Trophy by the New England Patriots. A decade later, he gets his second shot this weekend in Dallas. Last year, Pickett was a key part of the Packers No. 1 ranked rush defense that allowed just 83.3 yards per contest, a franchise record. 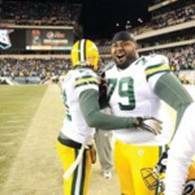 Pickett and Green Bay were the 5th ranked total defense in 2010, allowing 309.1 yards a game. The Packers defeated the Chicago Bears 21-14 to advance to the Super Bowl, where they will take on the Pittsburg Steelers. Pickett and the defense allowed just 83 rushing yards in the contest and he believes containing the run is the key to getting his first championship. Pickett, 6-foot-2, is nicknamed “Big Grease” in part because he tips the scales at 340 pounds. He said the weight comes in handy in frigid Green Bay. Pickett’s older brother Booker played at Zephyrhills and also in college at the University of Miami. Booker still lives in east Pasco and was an assistant on the Bulldogs football team last season. Pickett and his wife Jennifer have three daughters, Esther, Abigail and Lydia, and one son, Ryan Jr. Pickett said his boy is only 3-years-old, but already thinks he will follow in his father’s footsteps. Kickoff for Super Bowl XLV is scheduled for a 6:30 p.m. It will be televised on Fox.